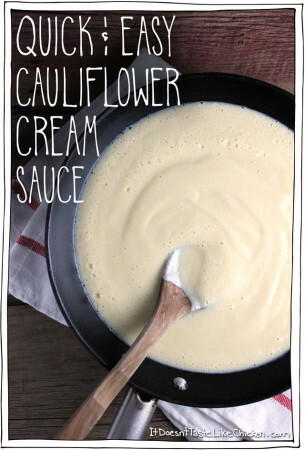 Have you ventured into the world of cauliflower sauces yet? If you are late to the party (like me), now is the time to join. Hey, arriving fashionably late is my kinda thing anyways. So what’s the big deal about this sauce? One pot (well two if you count a blender as a pot, and I don’t). Oil free. 7 ingredients. Just 20 minutes to make. Only 52 calories for 1/2 cup! Well hello sauce, did you notice my fashionably late self? Why yes, I would like to have a bowl of pasta with you. I’m flattered, thank you for asking. There have been so many recipes for cauliflower sauces floating around the internet. 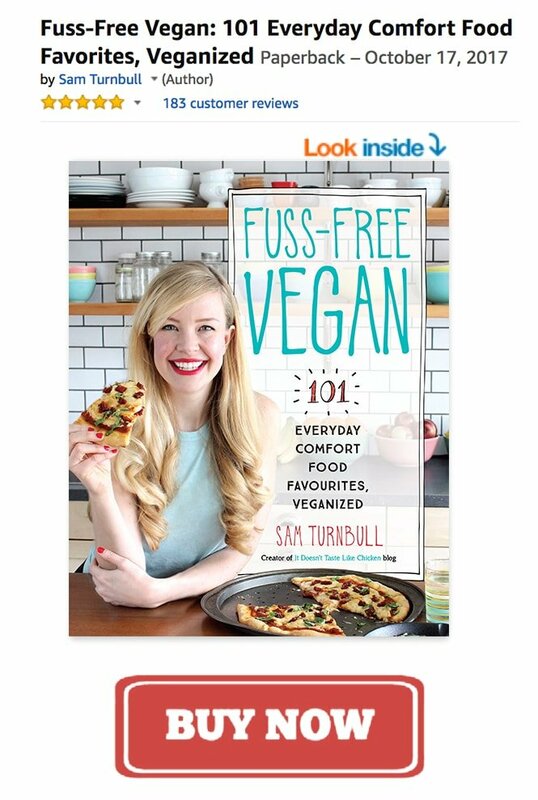 From Pinch of Yum, to Foodie With Family, to Leelalicious, to Fat Free Vegan Kitchen, and there are so many more! (See what I mean about being late). So to make my own version, I just started adding things to the pot until my kitchen was overflowing with delicious aromas, and I was drinking this sauce straight from the pan. Dreamy, creamy, saucy yumminess. The result is a velvety, luscious, sauce that is just begging to be licked off the spoon. In fact, my sister even thought the sauce was too rich! Muhahaha, sneaky, sneaky cauliflower. The ways to use this sauce are endless. 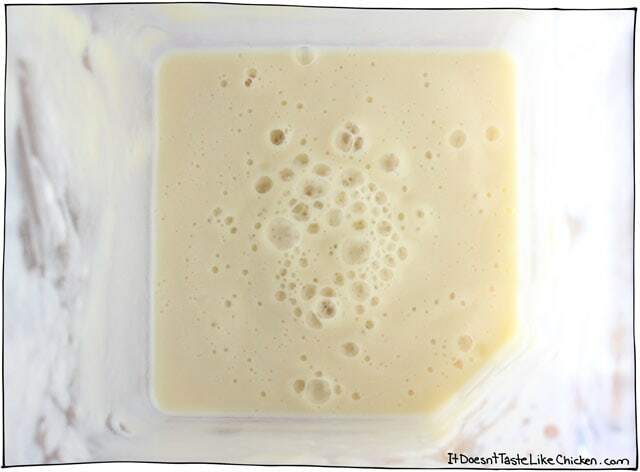 Toss with pasta, mix into a casserole, top on pizza, make creamy scalloped potatoes, drizzle over baked potatoes, use in lasagna, agh, I am already getting hungry and I just finished my breakfast smoothie. To make this recipe, just remove and discard the green leaves from the cauliflower, then hack it apart into even-ish sized pieces. It doesn’t have to be pretty, it’s going to be blended up anyways. 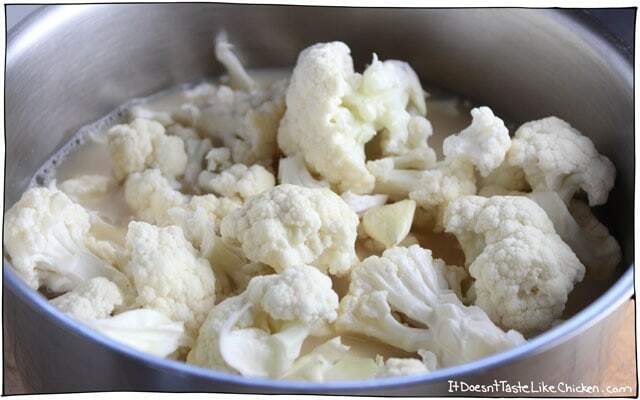 Add the cauliflower to a pot, along with three peeled cloves of garlic, the non-dairy milk and vegetable broth. Bring to a simmer and cook for about 10 minutes until the cauliflower is very soft and easily falls apart when pierced with a fork. 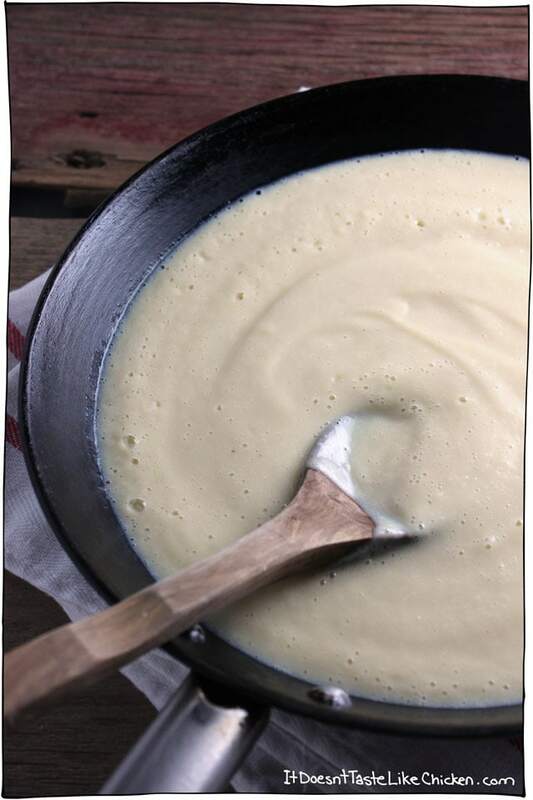 Once cooked, blend the cauliflower mixture with the seasonings, until smooth and creamy! That’s it. Done. Finito. One pot. Vegan. Gluten Free. Oil-free. 7 ingredients. Just 20 minutes to make. Only 52 calories for 1/2 cup! Add the cauliflower, vegetable broth, non-dairy milk, and garlic to a big pot, and bring to a simmer. Cook for about 10 minutes, until the cauliflower is very soft and falls apart when pierced with a fork. Now blend up the cauliflower mixture. 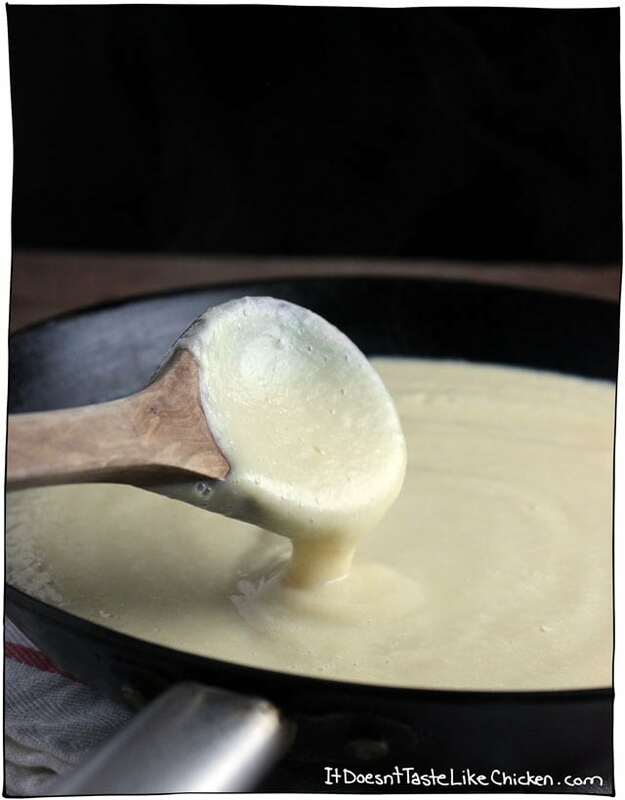 You can use an emersion blender and blend everything together directly in the pot, or you can use a standing blender and blend the cauliflower and cooking liquid in batches, being careful not to fill the blender too high so the hot liquid doesn't explode out the top. Add the nutritional yeast, white miso paste, and salt and blend to combine. If you find your sauce is too thin, return the sauce to the pan and cook it down a bit more stirring often so it doesn't burn. If it is too thick, add a bit more vegetable broth or water. The ways to use this sauce are endless. Toss with pasta, mix into a casserole, top on pizza, make creamy scalloped potatoes, drizzle over baked potatoes, use in lasagna, you name it! Featured Ingredient: Cauliflower. 22 Recipes, 19 Days to go! Wow, this was great. I subbed the miso with grainy mustard only because that’s how I used to do cheese sauce. I had precooked some veg to BBQ but the pumpkin was over cooked so I threw it in and blended it with the sauce. We had it with the BBQ veggies and the next day with pasta. delicious. I’m not sure ow I stumbled into your site but will certainly have a good look around. In my “winner winner” file. Haha, wonderful! Thrilled you are enjoying my recipes, Kathy! I love this on pasta but want to try on pizza. Do you think it could be done ahead and frozen? I believe the sauce should freeze just fine. Enjoy! Could I substitute red miso instead? Yes, but it might tint the sauce a bit. So happy you enjoy it, Andrea! This looks super good and easy. How long does it last in the fridge? I would say about 4-5 days. Enjoy! I’m late to this party, but I tried this sauce tonight for the first time, and just had to say how delicious it is. We think it would be good as an Alfredo-type sauce for lots of things – potato salad? We just used it as a kind of gravy over potatoes, pinto beans and diced tomato. 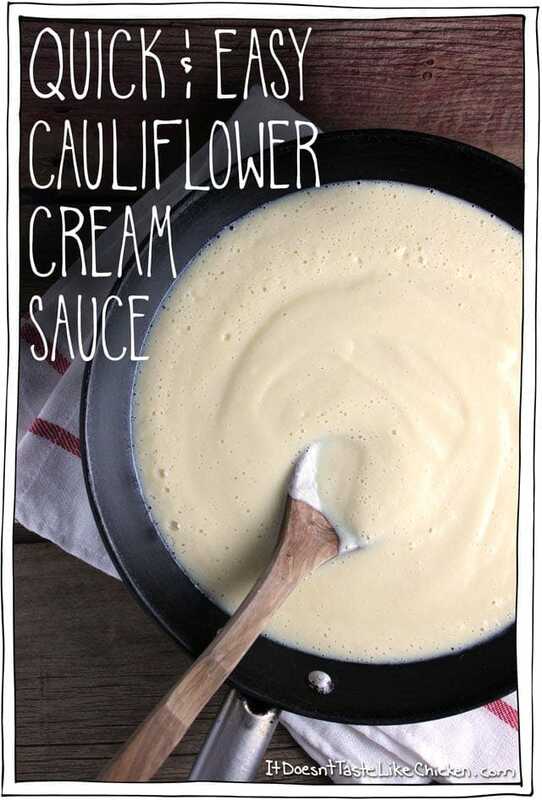 The thing that impressed us was that it just doesn’t taste like cooked cauliflower at all – just a nice, versatile white sauce that happens to be really good for you. Thank you so much! Any idea how many cups of cauliflower? I normally use fresh, but, happen to have frozen on hand and thought I’d use that up. Just unsure how much to use. Thanks. I would say about 4 cups of florets. I hope it turns out wonderfully for you! I’m so going to do this! Just wanted to suggest, you can say it’s a one pot dish with a clear conscience if you use an immersion blender. Tricky! I can’t keep up with you! I make most of your recipes and am always pleased. Want to say I support your quitting your day job and appreciate all your blog postings. Three years ago I quit my job and moved to Costa Rica. Cooking vegan was at first a challenge, but now I think I’Ve got it down (ha, maybe). Your recipes use many ingredients that I can get, which is not easy! The cauliflower creamy sauce and healthy mac & cheese was very do-able and delicious. As a long time cook, I appreciate your attention to detail, e.g. “if sauce is too thin cook a bit longer”, great tip and right on target. My personal opinion about the miso? I think the miso adds a certain depth in flavor so I would not want to omit it. Keep up the great work! Thank you for your support, and so happy you keep on enjoying my recipes!! Yes, I agree. I know miso is a little bit more of a picky ingredient than I like to use, but once you pick up a tub it lasts a long time, and adds so much flavour depth to recipes. Thank you for saying hi, looking forward to seeing you around! I am definitely making! I like the idea of white miso – yum. I may make this weekend with some fettucine – what could be better (besides the red pepper nacho sauce)? So tasty …I made the sauce with your pasta recipe with broccoli…yummy! Yay! So happy you enjoyed it Anillehs! Welcome! Yes, the miso paste is for flavour. Miso has an umami flavour adding a delicious savoury layer. I love using it in all sorts of recipes, so it’s a good thing to keep on hand and keeps a long, long time. If you don’t want to buy it, you can skip it, but you may need to boost the flavour with some other seasoning. I tried searching for the miso paste today, but had no luck finding it. What section is it usually in in the grocery stores? It’s usually sold in grocery stores, right? Thanks! It is in most major grocery stores yes, you should find it in the Asian section on the shelf. Otherwise you can buy it online here. Once you have a tub it will last you quite a while. Hope that helps! and … is miso paste absolutely mandatory? Any substitute for it? Wow, three questions! Haha, no problem! Nutritional yeast is a dry products so if it gets wet it might go off, otherwise if it looks and smells fine, it probably is. As for the miso paste, that adds a delicious umami flavour. If you don’t have it, you could try seasoning it with just a bit of extra salt. It will still taste pretty darn good. Sammie, I just bought a cauliflower and was wondering what to do with it. Now I know. Question: Does nutritional yeast have a shelf life? I’ve had some in the cupboard for a year now. Still good? This looks great. Do you think I could achieve something similar if I make it with frozen cauliflower? Welcome! I don’t see why that would be a problem, my guess is it would turn out just fine. 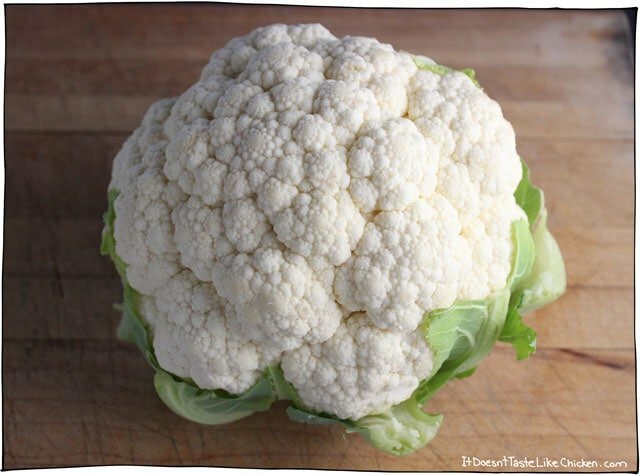 Just make sure to drain off any excess water before using the cauliflower. Enjoy! So I finally got around to trying this recipe…. AMAZING!!! I love it. You should include in your uses – “straight, from the blended into your mouth”. This is defiantly going into my keeper folder. Haha, yeah I pretty much drank the stuff too. Thanks for leaving your review Katie!